Jurassic Park and its sequels have never been what you'd call scientifically accurate. (Sorry, Dr. Malcolm, standing still isn't camouflage.) And, yet, somehow, the lack of feathers is the inaccuracy that most rankles. Does it really matter that the new dinos will be scaly instead of soft? You bet it does. Here's why. A Kinja-conversation today about the lack of feathers in the latest Jurassic Park movie kicked off with a question: Why was the lack of feathers so divisive? After all, it was hardly the first paleontological diversion the franchise had come up with (see: everything about the film's velociraptors). Besides, they asked, in presenting us another set of dinosaurs without feathers, wasn't the latest film just being consistent in building the world it had set up, using the best knowledge it had at the time? So, is it really so important that, in a movie that doesn't pretend to be anything other than science fiction, that it take this one swerve towards scientific accuracy. In a word, yes. Admittedly, part of it is simply visual: Dinosaurs are cool. Feathers are cool. Feathered dinosaurs are just that much cooler. But also, part of the appeal of the original Jurassic Park, both the book and the movie, was that, even when it was sometimes mangling science, it dealt with science as a constantly moving target. Its primary characters were active researchers, both theoretical and practical, and for better or worse, the action of the story revolved around that research and how the fruits of it should be used. Unfeathered dinosaurs may give us the amber-preserved version of the old Jurassic Park dinosaurs slightly updated, but a much better tribute to the original would be to give us what the best science available says we should have: feathered dinosaurs. What do you think? Read the conversation, and then add your own thoughts on the feathered vs. unfeathered debate into the comments! Actually, and just to stunt the absurdity, it's hard to believe how incredibly old Jurassic Park is. When Michael Crichton wrote his books, the scientific field was having a huge debate on exactly what to call the "deinonychus" It was the cutting edge of the time. The Utah raptor hadn't even been discovered yet. To publish, Crichton punted, named it a Raptor and wrote the book. I think Spielberg's driving factor was what the puppeteers could fit into. So to appease your senses, just imagine that Jurassic Park uses bald dwarf Utah raptors and it all checks out. I think it comes down to consistency with the first films (when we didn't know, or at least there wasn't a consensus on dino feathers, right?). As weird as it may be to have inaccurate, scaly dinosaurs, it'd be weirder to have them for 3 films, and then suddenly feathers. Because feathers make everything better. Joking aside, I do think movies like Jurassic World should shoot for some level of scientific accuracy. What frustrates dinosaur lovers like myself is the original Jurassic Park really revolutionized how dinosaurs were portrayed in the popular media. Yes, the raptors were too big, and the Dilophosaurus too small. But before the movie images of tail-dragging, sluggish dinosaurs were actually quite common in portrayals of dinosaurs. 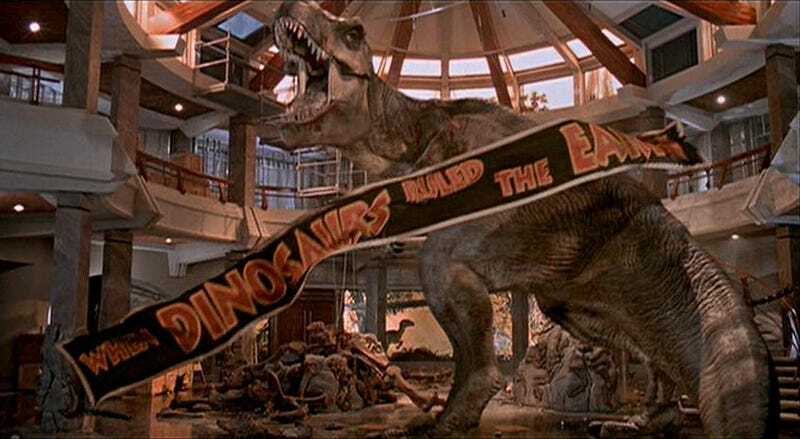 Jurassic Park did more things right than wrong when it came to dinosaur science, and the movie was the first introduction for most of the public to a revolution in our understanding of the animals.